YSU Falls Short: Morse’s 35 Not Enough to beat WSU. 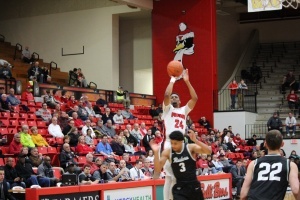 The Youngstown State University men’s basketball team (10-18, 4-11 Horizon League) entered Thursday night’s game against Wright State University (18-9, 9-5 HL) looking to end a four-game losing streak. The Penguins beat WSU 80-75 on January 7. They couldn’t do that twice as Wright State defeated YSU 84-81. WSU took the opening tip-off and junior Justin Mitchell scored the game’s first three points. YSU junior Francisco Santiago answered with a deep two to bring the score to 3-2 early in the first half. Guard Grant Benzinger helped WSU take a quick 11-6 lead with 16:08 thanks to his hot shooting from three. YSU junior Cameron Morse got started five minutes into the game. He hit a 3-pointer and had an assist to center Jorden Kaufman on back-to-back possessions that cut the WSU lead to four. Photo by Marc Weems/ The Jambar Cameron Morse (24) hits a three over Mark Hughes (3) in YSU’s loss to WSU. WSU led the Penguins 17-13 after a mid-range jumper by Santiago. Both teams traded turnovers over the next four possessions. YSU had five turnovers after the first 10 minutes of play. A three from Raiders’ forward Steven Davis sparked a 10-0 run for Wright State who led YSU 32-21 with 6:08 left in the half. Morse ended that run with a mid-range jumper. Kaufman was fouled with two seconds left in the half but missed both free throws as YSU trailed 43-34 at halftime. Wright State guard Mark Alstork led all scorers with 12 first half points. Kaufman led the Penguins with 11 points and five rebounds. The Raiders shot 45.5 percent from three in the first half while YSU shot 27.3 percent. YSU began the second half with possession and two free throws from Morse cut the Wright State lead to seven. With 16:47 left in the game, the Raiders led 51-40 after a three from senior Mike La Tulip as WSU continued to rely on perimeter shooting. The Penguins would not go away in the second half and cut the deficit to four after a steal and jumper from Morse. WSU led 65-54 with 10 minutes left in the second half. YSU answered every WSU run with a run of its own. A fast break layup from Morse brought the game within one with 3:40 left. Morse had scored the Penguins’ last 15 points at that point. The Penguins trailed 82-81 with 21 seconds left in the game after Kaufman scored a put-back off of a Morse missed three. Alstork hit both free throws after being fouled to make a three-point lead. He was 11-11 from the free throw line on the night. YSU senior Brett Frantz missed a game-tying three with 2.6 seconds left to play as the Penguins fell to WSU 84-81. Slocum said that he was impressed by Morse’s and Kaufman’s performances. Morse led all scorers with 35 points, 28 of which came in the second half. Kaufman was a point shy of his career-high with 17 points and added 8 rebounds. For WSU, Alstork led with 33 points and five rebounds. YSU plays it’s home finale against Northern Kentucky University on February 18 at 7:00pm.